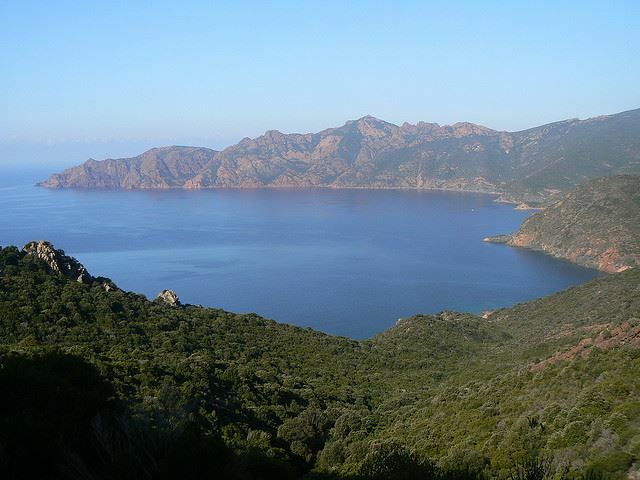 A fairly tough but hugely rewarding trek through the coastal mountains of northwest Corsica. Changes in altitude make this slow going, but the rewards in terms of breathtaking sea and mountain views make it well worth the climbs. 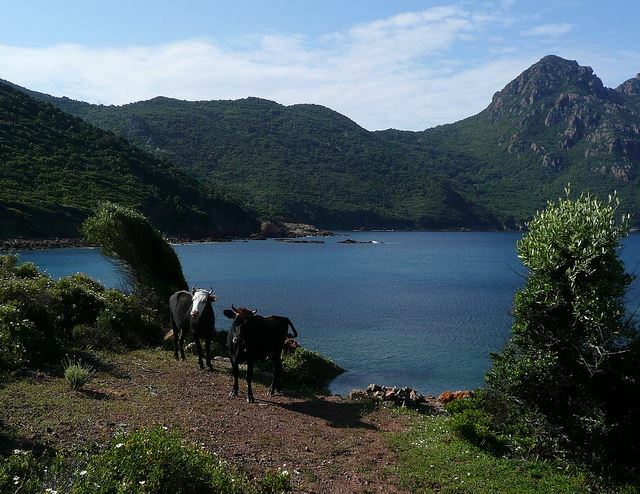 The Mare e Monti is one of Corsica’s most celebrated trails, described in the excellent Cicerone guidebook as “easily the most wonderful long-distance route in Corsica”, and it more than deserves its reputation. 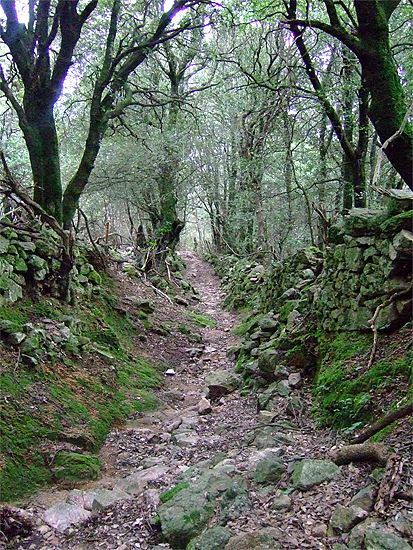 This is, though, a tough switchback of a walk, which runs from Calenzana, 12 km inland from Calvi on the North-west coast, to Cargèse 125km further south; the fact that it is generally regarded as a 10-day trip attests to its demands. It rewards with breathtaking sea-and-mountain views at every turn. Day 4is one of the best, crossing a wonderful wooded ridge that skirts – and offers stunning views of – the protected Scandola promontory nature reserve and the sea beyond to fetch up at Girolata, an extraordinarily atmospheric largely seasonal fishing village only accessible by sea or foot. 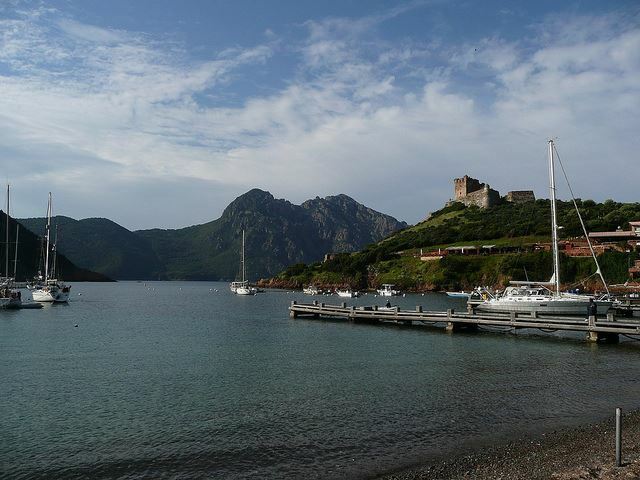 (Just under 12km, 5 hrs) See our Girolata page for day walks in and out. Day 7: a long uphill grind gets you to Bocca San Petru at 900m, right above the sea, where the views explode spectacularly (do divert to the nearby peak); a high traverse then a long and steep descent down a superb ravine followed by a traverse to the gites at Ota, which is beautifully sited overlooking a huge bowl surrounded by a high craggy ridge. And Chez Felix restaurant. A highlight day. (11km/6hrs) This is such a good walk, we have it separately as a day walk. Waymarking is generally in the form of stripes of orange paint on rocks, walls and trees along the route, though occasionally with the letters TMM, representing the route’s local name, Tra Mare e Monti. 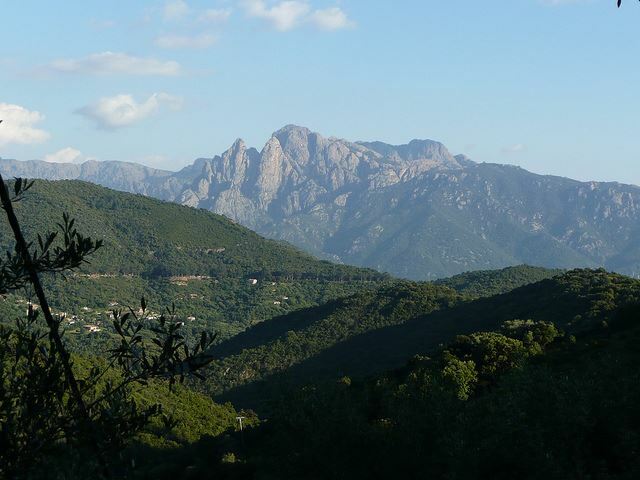 Getting to Calenzana (start point for Mare e Monti): depending where you are on the island, treat yourself to a thrilling trip on the rattling narrow-gauge railway to Calvi. This is an adventure in itself, and passes through Corte, in the central mountains, a good jump-off point for many other walks. From Calvi, it’s a 12km bus ride – but it only runs in midsummer, twice a day, from the railway station. Otherwise, your best bet is to catch a cab (or find other walkers to club together to do so; this is a popular path), though it’s not unknown for people to catch the school bus. Accomodationis mainly gîtes; try to book ahead at popular times, for luck. It is hard to find accommodation in winter, so this is a spring-to-autumn walk. Unless you plan to load up and camp. Remember that the last 2 days share a route with the Mare-Mare Nordso accommodation can get booked up – book well ahead. Key book: Cicerone’s Walking in Corsica. 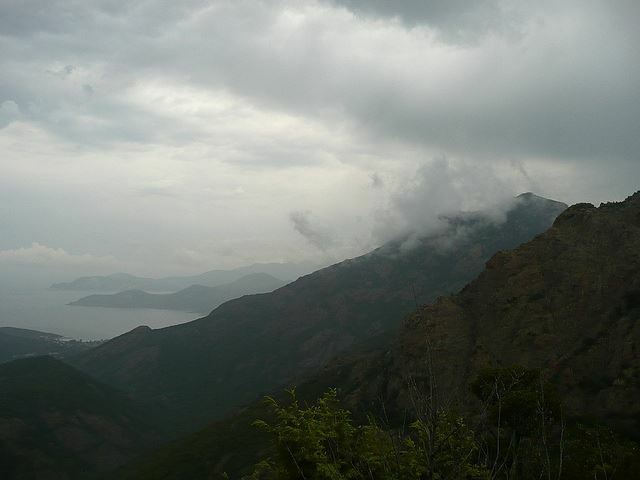 For more information and photos, including detailed practical information and some warnings, see our Corsica walk page. All photos and suggestions welcome! 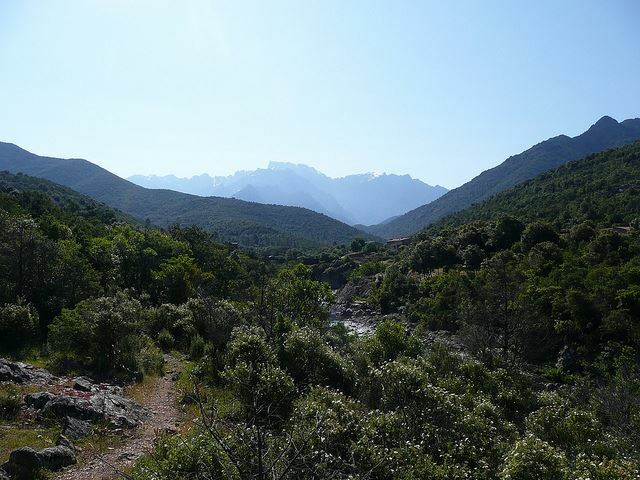 This superb gorge walk (on the Mare e Monti route) between Evisa and Ota is one of Corsica’s finest day walks, and that is saying something. I did this walk in late May 2015 as part of the final rehab goals in my recovery from a bad ankle injury (fractures, pins, etc). It is perfectly doable by anyone who is able to plug away slowly, taking care as the paths are rocky with slippery stones. Otherwise, it is not particularly difficult: I would rate it as medium difficulty. The path is well signposted and I did it alone without getting lost. 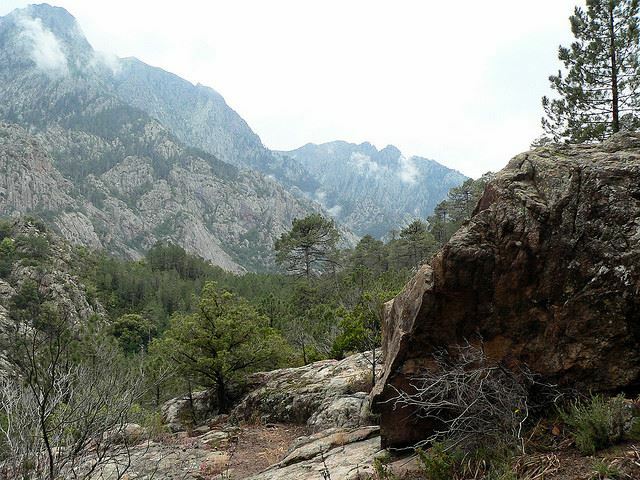 This is one of the world's easy hikes in terms of risk: no high altitude, no dangerous animals (reportedly there are bears, snakes, angry pigs but I saw none), no developing world security issues. The biggest danger would be slipping as the trails are challenging in that way. Or over-eating at night, as the food is incredibly tasty. As a north American, I was carrying far more baggage than the Europeans doing the walk. Everyone else seemed to carry just a light daypack with minimal clothes & no extras. I carried clothes for rain, cold & hot conditions, a sleeping bag & breakfast and lunch food. However, it seems that all the others relied on the blankets in the Gites d'etape and paid for the demi-pension, which gives you a hearty Corsican multi-course dinner, a not so interesting European breakfast (coffee, white bread & jam), and there was an option of buying sandwich lunches. Reservations in Gites d'etape are essential and at present can't be done on line for this walk: you need to phone ahead. Finding the tel nos takes a bit of on-line trouble as the links are not always updated. Payment is by cheque for Europeans, but Nth Americans have to carry cash as most places do not accept credit or debit cards. 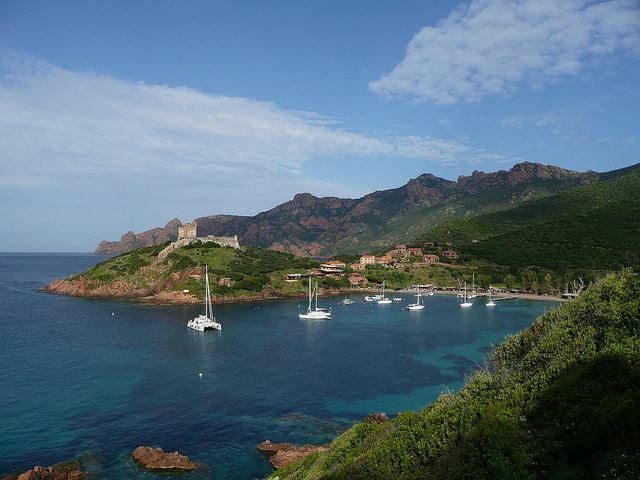 Maps and guides can be purchased in Calvi at the start of the walk. The beauty and the natural landscapes of this walk are superb. Highly recommended, especially for those of us who like to travel alone. No need to join a tour or a group for this walk, as you are travelling every day with the same cohort of hikers who do it by the same stages as you. You will eat meals together at night and share the same dorms unless you are carrying a tent. For solo folk, I recommend leaving early each day, or late, if you don't want to walk with others. Numbers on this hike are far less than on the GR20, so most of the day I was totally joyfully alone. 17 walkers started the walk on the same day as I did, and 5 of us completed it: others dropped out due to time restrictions. Note: the bedding in some of the gites is not so clean: take a sleep sheet. Walkopedia says THANK YOU Globalwalker for these BRILLIANT and very helpful notes. MUCH appreciated. I walked the Mare e Monti in a Corsican summer with my wife in 2015. It was a beautiful walk, but sections were tough and it was very hot. 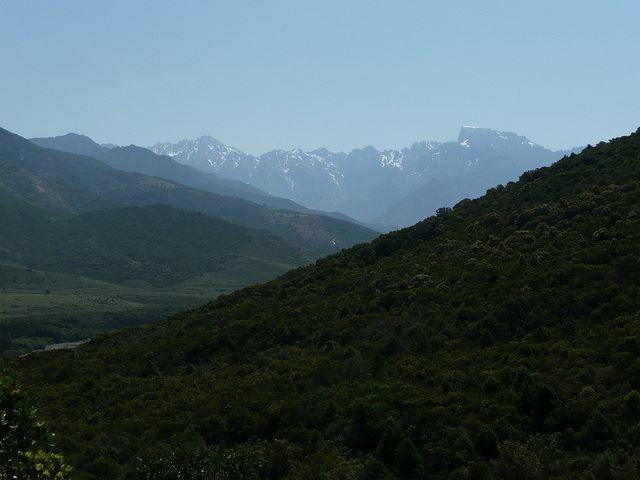 Corsica is a great place - wonderful beaches, stunning forests, towering mountains, delicious food and wine, and generally happy, friendly people. We do not speak French, so we couldn't pre-book the gites along the route. We took a tent, but opted to pay for the demo-pension for more than half of the trip. Our packs were not full, but contained our tent, sleeping bags, clothes for various weather conditions, and plenty of water! They were probably 10-15kg, but as it was more than 30 degrees (Celsius) everyday, they seemed heavier. Generally, each day is well planned allowing for the terrain - shorter days tend to be the steepest - and you arrive at camp happy to put your feet up. We used to stock up on snacks/supplies if we were staying in a town. Like others have said, it is not a crowded walk, and you tend to be by yourself for long periods of time. This ideal, as it allows you time to appreciate the beauty around you and walk at your own pace. Highlights for us were: - Galeria to Girolata is a beautiful days walk. The heat made it very difficult for us, but the scenery along the way, and both the towns, made it spectacular. - Serriera. We needed to complete two legs in one day, so we decided to walk from Girolata to Serriera in one hit. It was a long, hard day, but the site at Serriera is brilliant. It is run by a lovely woman who is a dynamo, and it is in an old olive mill. It was our best night. The food was fantastic, with wonderful wine and cheese, and the fellow French hikers were engaging and entertaining! - Gorge de Spelunca are beautiful and refreshing, and worth spending time exploring. Lowlight: - the gite manager at Revinde. An unpleasant man, who had no time for you if you were not Corsican (he was even rude to our French travellers!). Even unfriendly and unhelpful the next morning as we left. Overall, a highly recommended walk. It pays to be reasonably fit and experienced - especially if you attempt this in extremes of weather. We are both in our early 50's, exercise regularly and have hiked every year for 30 years. Walkopedia says THANK YOU for this very helpful contribution!